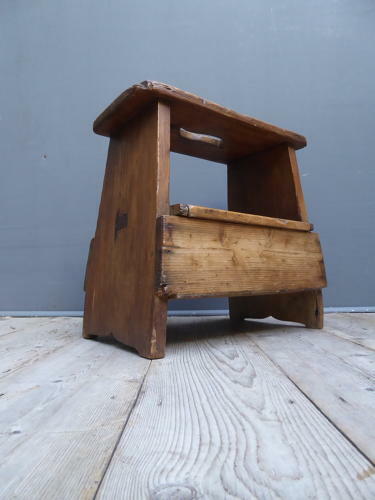 An beautiful example of a Victorian pine shoe shine stool. A wonderful, rustic shoe shine stool in solid pine with single plank top with cut-out 'S' handle & lower storage section with twin hinged doors. Perfecctly formed & boasting the perfect amount of wear with a fantastic patina. Wear commensurate with age, beautiful unrestored condition. The underside of the stool is in thin hardboard which is a non-original but historic replacement & does nothing to detract.